Earlier this month I posted my first attempt at layering a stamped image using Nestabilities dies. You can see that post here. 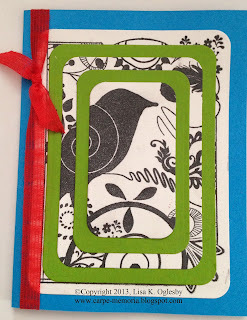 Last week I purchased the A2 matting dies and found that they are perfect for playing with this technique. 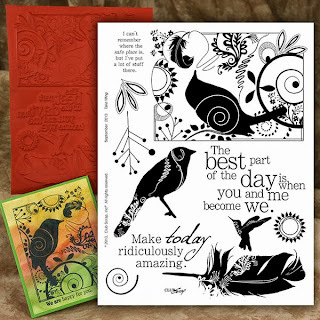 The card features the collage stamp from Club Scrap's Take Wing collection UMs. Isn't this a great sheet of rubber? So many possibilities! The green paper is from Take Wing, while the beautiful blue and the red ribbon are from Peacock (October 2012). Stay tuned for my next post where I show how I used one of these stamps on a Christmas card. Hmmm . . . which one will it be? Oh, yes, QoD, you could definitely use them. 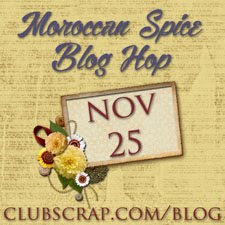 Take Wing Blog Hop Tomorrow!